This lovely Villa is set in one of the most picturesque and prestigous areas in Golf Del Sur. Just a few yards from the sea, and in a very tranquil area yet it just 2 minutes walk from the resort centre, this villa could provide the perfect location for your next Tenerife holiday. With a front garden, a lovely terrace, and a well kept villa, this is like bringing your home out into the sun!! The villa also has air conditioning in the living room and the upstairs bedroom. The master bedroom has ceiling fans, and there are also two mobile fans which can be used throughout the property. Sleeping up to 4 people this villa has 2 bedrooms, both of which have ensuites! You walk in up to the villa through the front garden, which is nicely secluded from the quiet road in front. A nicely raised terrace gives you nice sea views whilst you dine outside or simply relax in the sun. Walking into the villa, you are greeted with a spacious and comfortable living room. Satellite TV is provided with both German and UK channels including BBC1, 2, ITV, CH4 etc. The apartment also has wifi. An off-shoot from the living area is a utility room housing a washing machine. The raised and separate dining area has a table and chairs for 6 people. 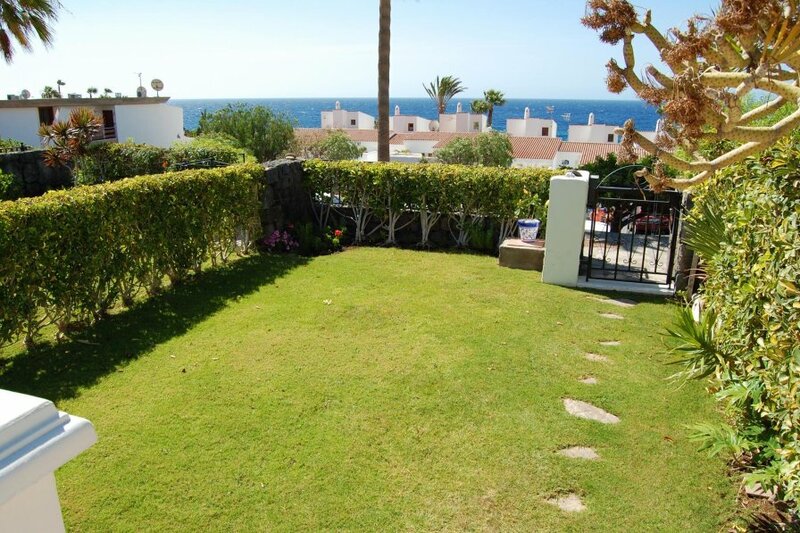 Here you will again enjoy views over the front garden to the sea. The kitchen is large and well equipped, including a hob and a microwave. Beyond here, is the huge master bedroom with kingsize bed, ceiling fan and ensuite with bath and shower. Stairs from the side of the kitchen lead to the upstairs twin bedroom - including air con - and again lovely sea views. This bedrooms also has an ensuite with shower. The villa shares a gorgeous communal pool right on the sea front. Only owners and their guests have access to this private area and it remains one of the most tranquil and exlusive pools in the area. Huge 6 seater sofa, Television (FULL English and German channels). Patio doors to front terrace and gardens. Air conditioning. King size Bed, Fitted Wardrobes, Ceiling Fan, Ensuite with bath and shower. Twin Beds, Ensuite with shower, Lovely sea views. Air conditioning. This apartment is looked after by a Local Management company and you will be given their contact details after you have booked. The Villa has an outside terrace with partial sea views. There is an outside dining table and chairs for eating al fresco. The upstairs bedroom with ensuite has its own lovely sea views.